The violence behind gun control shows through once again, as a grieving father of a shooting victims gets nasty with a Pro-2nd Amendment lawmaker who has refused to give into pressure to pass gun control legislation. A State Senator in Virginia has gone public with concerns for his safety after receiving bizarre threats from Andy Parker, the prominent gun control advocate and father of slain TV reporter Alison Parker. Shortly afterwards, Stanley applied for a concealed carry weapons permit, something the gun owner and gun rights legislator said he never felt he had needed until now. “I take this very seriously as a threat against the safety of my family,” said Stanley, who contacted Capitol Police and the Franklin County Sheriff’s Office. “We are proud firearms owners, but I never felt the need for a concealed carry permit until now,” he said. Parker confirmed that he sent the message, but said the only intended threat was political. 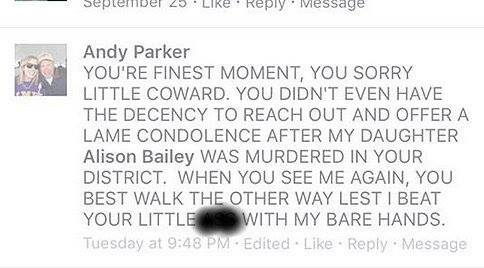 Parker sent Stanley another Facebook message after a Washington Post reporter contacted him about the alleged threat. McAuliffe characterized the message, which Parker said was a political threat, as ill-advised, but he suggested Stanley was blowing the issue out of proportion and knew Parker did not intend physical harm. Michael Bloomberg’s Every Town for Gun Safety is spending a reported $2.2 million to air ads for gun control that feature Andy Parker. Ironically, given his gun control stance, Andy Parker publicly stated his intentions to buy a gun for personal protect after the murder of his daughter, before reportedly changing his mind. Andy Parker has become a controversial figure, after the sensational and tragic murder of his daughter and a cameraman who were shot during a television interview by what is supposedly a disgruntled former station employee, Vester Lee Flanagan. Conspiracy theorists have centered around claims that the event was staged, and that Parker is a crisis actor. Oddly enough, Parker is a former professional actor who appeared on TV during decades past. The victim’s father made statements about being sent “semithreatening messages” by people on the Internet.